With arguably one of his greatest ever McCain UK Cross Challenge performances, Andy Vernon won the senior men’s race of the McCain Liverpool Cross Challenge Series incorporating the European Cross Country Trials at Sefton Park this afternoon (Saturday 26 November 2011), while in an equally gripping senior women’s event, Hatti Dean (coach: Bud Baldaro) saw off Gemma Steel (John Nuttall) to take victory. In mild but increasingly windy conditions, the McCain under-23 titles went to the highly impressive Hannah Walker (Bud Baldaro), eighth on the track over 5000m at the European Under-23 Championships in July and Mitch Goose (Tim/Pauline Ash), who, following a 40th place finish in last week’s NCAA Championships, returned to the UK in a bid to make the Aviva Great Britain & Northern Ireland team for the European Cross Country Championships in Velenje, Slovenia on Sunday 11 December. 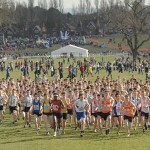 The junior events were won by Aldershot, Farnham and District duo Emelia Gorecka and Jonny Hay, both coached by Mick Woods, who will be looking to translate their top European finishing positions in the 2011 IAAF World Cross Country Championships into gold medal performances in Slovenia. Event reports and provisional results are below. Andy Vernon should now be known as Mr McCain Liverpool Cross Challenge. Sefton Park is like home from home for the Hampshire athlete and three time overall Series champion after he recorded a second successive victory in this event following his 2010 triumph, in a time of 29 minutes and 19 seconds over the 9.8km course. Even a delayed start due to the sheer number of participants did not distract from the 25-year-old’s mindset to win in impressive style in blustery conditions on Merseyside. James Walsh (Mike Baxter) took the early lead, heading a 30-strong front contingent. Following in close pursuit was Frank Tickner, who won the McCain Bristol Cross Challenge earlier this month, Ryan McLeod (John Nuttall), Vernon, Ben Whitby (Andrew Hobdell) and Mark Draper (Andrew Hobdell). At the half way point, the leading pack made a clean break from the masses and formed their own battle, with Andy Baddeley (Andrew Hobdell) entering the fray too, with very little to choose between them. As the race entered the final stages, tension in the crowd grew as the title and automatic top three qualifying places in the Aviva GB & NI team for the forthcoming European Cross Country Championships. But it was Vernon who took the race by the scruff of its neck in the home straight to power past Draper to earn a deserved win, with McLeod finishing in third. “It’s hard, it’s a tough course,” said Vernon. “There is nothing to break up the running; there are no hills or anything like that. You are just churning the whole time and it’s really hard to make a break. It always comes down to three or four guys at the end. It’s starting to get annoying – I wish I could have an easier run-in! In the last 30 seconds I just gave it everything and it seemed to work. Second and third place finishes for Draper (29:22) and McLeod (29:24) automatically earned both a place in the Aviva GB & NI team for Slovenia and both were delighted with their performances. “It was always my plan to come out here and make the team and to test out how the first part of my winter had gone,” said Draper. 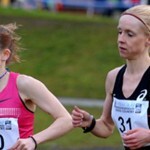 After a dominant victory in the McCain Bristol Cross Challenge, Gemma Steel came up against her first seriously tough opposition of the season as she led a small group in the early stages of the senior women’s 8.1km Trial event alongside Hatti Dean. The leaders, who going into the first big loop also included Julia Bleasdale, Freya Murray (Steve Jones), Hannah Walker (Bud Baldaro), Elle Baker (David Turnbull) and under-23 Emma Pallant (Mick Woods) were soon split as they came back into spectator view and into the first internal loop. Steel and Dean, now with a slight lead of around five seconds, were pulling clear of Stephanie Twell (Mick Woods) who had moved into third after working her way steadily through the field; in the chasing pack, Murray and Walker looked to be strongest, with Naomi Taschimowitz (Charlotte Fisher), a member of the Aviva GB & NI World Cross team in March, also making her presence felt. The front two continued to push and their lead grew to around 12 seconds with Walker now third and Scottish duo Murray and Twell working for fourth and fifth. Dean had the speed to hold off Steel in the latter stages however, and finished four seconds clear in 27:05 with the Charnwood athlete clocking 27:09. Murray battled through to take third from Walker in the last few metres although both were credited with the same time of 27:32 and Birmingham University-based Walker taking the under-23 honours from Twell (27:37). 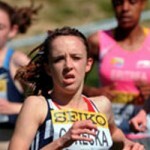 “I knew Gemma was in good shape but she’s not always been up against such good quality competition until today,” admitted Dean, who said it was a bonus to make the team after missing a month of running due to injury prior to her departure to the UKA/London Marathon altitude camp in Kenya. “I had no idea what shape I was in, I felt really good in Kenya but I wasn’t doing track sessions just a lot of mileage and sessions on the roads so I didn’t have real markers.